Fly High offers great activities for families and friends of all ages. Our premier trampoline park accommodates any beginner jumper all the way to the most seasoned and technical jumper. 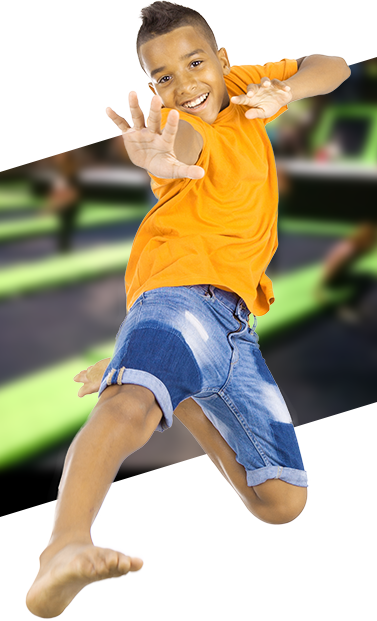 Try flips, tricks, and stunts with wall to wall trampolines, wipe-out, drop zones, basketball, foam pits, airbags, parkour, ninja warrior obstacles, super trampolines, Olympic trampolines, kids courts, nets course, arcade, Nerf course (dart wars), and more. We are Kid Birthday Party experts and a private host is assigned to each booking. Children’s birthday parties are available to book right now online. We have many party packages to help celebrate your special day and can be catered to your needs. Fly High is voted Best Kids Birthday Party Place year over year so come see what everyone is talking about. If you have an event or party to plan, we have several party packages to cater to your needs. Want the whole place to yourself? We can make that happen as well with our private event package. Call us at (801) 605-8777 for more information. Also, now serving Zeppe’s Italian Ice at Fly High Adventure Park in Ogden! Grab a cool treat after your jump or stop by anytime for one of their famous Gelatas. Come Celebrate with us At ogden! Who will come out the victor on this dodge ball court? Fly even higher on the bounciest trampolines in Utah.